Shortened machine time and consistent loop feeding help increase productivity. Machine time 1.2 sec. / belt-loop. The machine time is 1.2 seconds per belt-loop (with 28 stitches). The new machine head specifically developed for belt-loop attaching machines runs at a maximum sewing speed of 2,500rpm and is equipped with a direct-drive system that improves start up performance and shortens sewing time. The belt-loop feeding device is now provided with a halfway standby capability for subsequent belt-loops, and its faster belt-loop supply action shortens the time required for supplying belt-loops and helps speed up the machine time to 1.2 seconds per belt-loop (with 28 stitches). With the improved consistency in belt-loop supply action and re-try capability, the machine down time is substantially reduced. Belt-loops are fed out by the conventional gear-roller feeding mechanism and also drawn out by the new drawing mechanism on the clamp device. Supported by these two mechanisms, the folding fork catches curled or creased belt-loops every time and supplies them to the head. 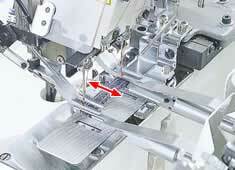 In addition, the sensor of the clamp device detects the presence/absence of belt-loops. If it detects a faulty belt-loop feed, the clamp device automatically repeats the clamping action. Since the operator doesn't have to operate the set-back switch, less time is lost. The machine quickly and reliably disposes splices without any delays in cycle time. 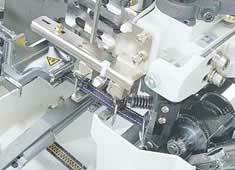 The machine preliminarily detects each splice in the belt-loops and efficiently disposes them. This means that even when the machine carries out the splice-disposal procedure, the belt-loop feeding device can complete its belt-loop supply action and supply the next belt-loop well before the machine starts to sew. 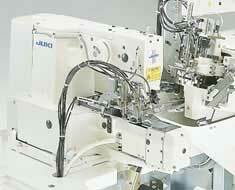 As a result, the operator can perform rhythmical and efficient sewing work with no delay in cycle time. By detecting changes in the material thickness, the machine's potentiometer finds splice in belt-loops and disposes them perfectly. When changing the material to be sewn, the change in the material thickness recognized by the potentiometer as a splice can be easily adjusted and programmed through the machines's teaching function. The standard machine incorporates a 1.8-fold capacity shuttle hook. 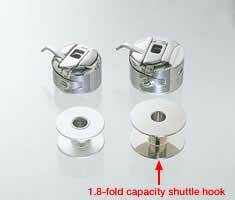 The shuttle hook improves efficiency by reducing the frequency of bobbin thread replacement. The machine offers improved flexibility. 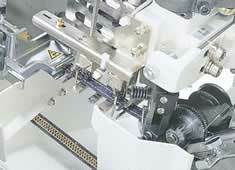 The newly developed machine head comes with a computer-controlled X-Y linear feeding system which enables to program the number of stitches and size of bartacking. The number of stitches to sew a belt-loop can be switched between; 28-, 36- and 42-stitches, and the bartacking size can be easily changed through the operating panel. What's more, the user can create his/her own original sewing patterns in addition to the standard ones using JUKI's PGM-20 programming software developed for computer-controlled sewing machines. Simple adjustment of the machine enables changeover of the cutting method between cross cutting and straight cutting. 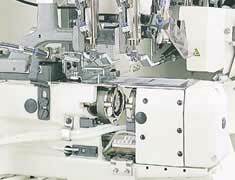 The applicable loop width for the cross-cutting device is increased. In this model, both the cross-cutting device and the straight-cutting device can now cut loop up to 20mm width. The machine offers improved operability, workability, and maintainability. An electric sliding mechanism is installed in the front hook (near the operator). The newly incorporated electric sliding mechanism is used to electrically shift the front hook when replacing the bobbin or conducting maintenance on nearby components in order to widen the space between the hooks and facilitate the job. In addition, when changing the needle gauge, the front hook can be finely positioned in increments of 0.01mm through the operating panel, thereby allowing the operator to easily adjust the distance between the blade points of the two shuttle hooks. Since the machine no longer requires any adjustment in the hook timing (phase), needle gauge adjustment is much simpler than ever before. 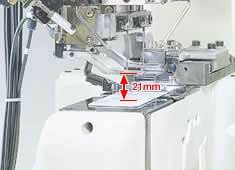 To enable computer-controlled belt-loop supply performance, the machine has adopted a servomotor-driven belt-loop feeding device that feeds the belt-loops to the sewing position (i.e.,under the presser foot). 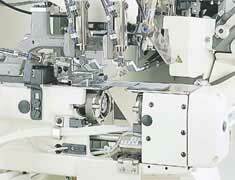 The belt-loop feeding position is automatically adjusted to the belt-loop width. 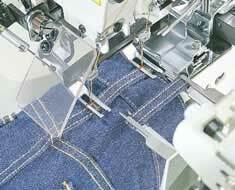 With this capability, the belt-loop width can be easily changed without mechanical adjustment. In addition, when feeding the belt-loop under the presser foot, the widthwise position of the belt-loop can be offset through simple manipulation of the operating panel.  The widthwise position of the belt-loop can be offset. The lift of the presser foot is as high as 21mm to ensure outstanding workability. To improve workability in replacing belt-loops, the belt-loops insertion opening through which belt-loops are supplied to the feeding device is now located on the front side of the main unit. The operator can visually check how the belt-loops are fed during sewing and prevent possible troubles in the belt-loop feed due to faulty loop-feeding paths. The machine is equipped as standard with an adjustable stand. The height of the working table can be easily adjusted to match the operator's height. 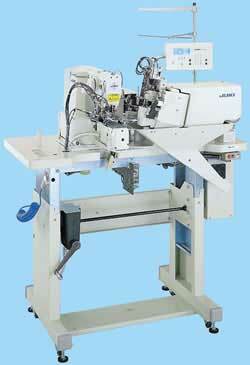 The operator can carry out sewing works in a comfortable posture with less physical strain and fatigue.